Learning about cat's claws and how they work is the key to understanding the method of declawing. A cat's claw is a sharp appendage attached to the end of the toe bone. Cat's use their claws for territory marking, hunting, climbing, traction, self-defense, and to "knead." Read Cat Claws for more on this. Now for the procedure of declawing. When a cat is declawed, it doesn't just remove the claw, but because the claw is closely connected to the bone, part of the end of the toe bone is removed as well to guarantee that it won't grow back. Declawing is not like the human equivalent of cutting fingernails. It is equivalent to having a finger amputated at the last knuckle. 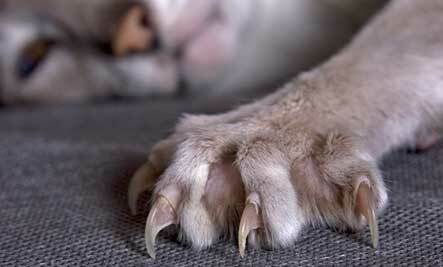 The effect declawing can have on cats can be serious in some cases. Because cats walk on their toes and this operation removes the end of the toe bone, it will be very painful. There is a lot of bleeding and it will be painful for a cat to walk for a minimum of six weeks or longer for some cats. Although this seems to have solved the problem, cats will still act as though they have claws. It should also be remembered that because its main defense is gone, it should now be considered a permanent indoor cat. Because this surgery can be traumatic and cause unnecessary suffering for the cat, there are several other alternatives that should be considered with declawing being a last resort. First, make sure you have a scratching post for your cat to scratch. It should be tall enough so that the cat can stretch as it scratches, and it should be sturdy enough that it doesn't tip over easily. Second, if your cat is being destructive with its claws, try training it to stop scratching the furniture and instead scratch a scratching post. This can be done with double sided tape on the furniture and sprinkling catnip on the scratching post. Also, if you can catch the cat in the act, gently pick him up and move his paws up and down on the scratching post which should be near areas where the cat often scratches. The main goal is to make the furniture unattractive and the scratching post attractive. There is also another great alternative called Soft Paws. Little plastic nail covers are glued over the nails to protect both humans and furniture and that is it! It sounds very promising, although you will have to know how to trim the cats claws a little before you put them on. Visit softpaws.com to see if this alternative might work for you and your cat! Declawing is only commonplace in America and Canada where people do it for convenience. Over twenty-five countries have outlawed it or think it is extremely cruel and inhumane. Please try every other alternative before declawing your cat.